Caceres is in the heart of an area of natural beauty. with sleepy rural towns and stunning nature reserves. Located in the western region of Extremadura, spring is the one of the best times to go, as this is when the cherry groves of the Jerte Valley are in blossom. It is equally breathtaking in the autumn after all the leaves have turned and the trees change into lovely autumn colours. There have been settlements in this area since prehistoric times, evidence of which you can explore in the Maltravieso and El Conejar caves nearby. Caceres was originally founded by the Romans and goes back as far as 34BC. However, it was not until Arab occupation in the 12th century that it enjoyed its greatest period of splendour. It was another century before Spanish Rulers eventually regained control of the city. Declared a World Heritage Site, it has one of the best concentrations of historic buildings in Spain. Many of the buildings were built using a brown stone, and when the autumn sun casts over these old stone buildings it has the extraordinary effect of the turning them a warm orange colour. Some of the mansion houses have a very decorative exterior, whilst others are more plain and austere, and a few have the former owner’s coat of arms carved into the stone facade. 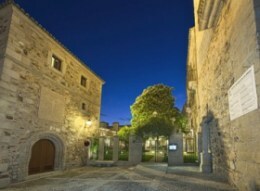 Caceres is particularly attractive at night when it is lit up by spotlights. The medieval quarter still has the original walls that once surrounded it, and because it has no outward signs of modern living, it has been the setting for many films. The main entrance into the old quarter is through a gate known as El Arco de la Estrella. Built in the 18th century, it replaced the Puerta Nueva that dated back to the medieval period. Brimming with palaces and ancestral houses, the Plaza de Santa Maria is a good place to start your tour. Here you will find the Mayoralgo Palace, which is the biggest in the city, and the Episcopal Palace is recognisable by the foiled arch at the entrance. One of the most beautiful examples of the city’s historic architecture is the 15th century Palacio de lost Golfines de Abajo, where Kind Ferdinand and Queen Isabella stayed during a visit to the capital. However, perhaps the most picturesque is the 16th century Carvajal Palace, with an ancient fig tree that is over a thousand years old in the centre of the courtyard. Just next door to this palace is a 12th century round tower built by the Moors. Another place of interest is the 15th century Santa Maria Pro-Cathedral with its three naves and rib vault ceiling. Inside is the image of Cristo de los Blazquez, also known as the ‘Black Christ’. For many centuries it was believed it brought death to all those who looked or touched it. Below the Plaza San Mateo is the Museum of Caceres, housed within a 16th century mansion with a beautifully preserved 12th century cistern underneath the courtyard. The museum has a collection of very interesting artefacts and explains the history of the province. Not far from there is the Plaza San Pablo where you will find the 15th century Caceres-Ovando mansion house. It is the only house to retain its fortress tower, as Queen Isabella had ordered all the other towers in the area to be destroyed, to bring peace amongst the local nobles. Should you decide to take a drive beyond the city, head for the highest peak of the Sierra de la Mosca. Not only does it have spectacular views of the surrounding area, but you will also find the Nuestra Senora de la Montana Church. Underneath this church is a cave where devotion to Our Lady of the Mountain began. Another place to visit is the Monfraque Nature Park. Filled with many lovely villages, it is also a favourite for birdwatchers. The park has many species of bird, but it currently has the world’s largest colony of Black Vultures and Imperial Eagles. 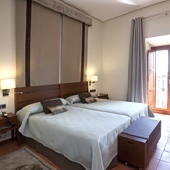 Within the city itself, is the elegant Parador Hotel Caceres. Once a 14th century palace, it originally belonged to a knight of the Order of Santiago. Today it is a luxury hotel, stylishly furnished, retaining many of its original features. It provides the perfect ambience and a very appropriate setting for this beautiful historic city.